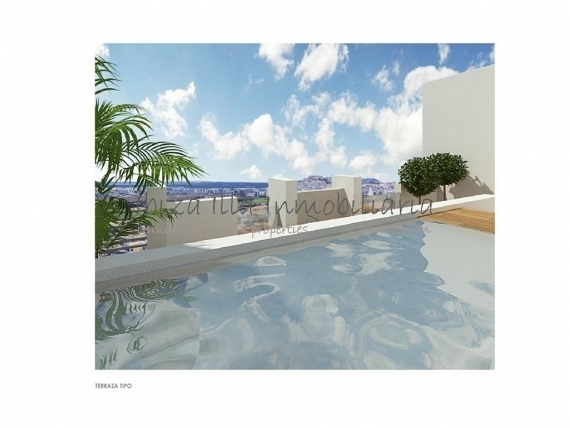 Penthouse with private pool, 4 double bedrooms and 3 bathrooms in Jesús (Ibiza). New construction. Estimated completion date end of 2019 early 2020. At number 23 on Falcó Street, just behind Cap Martinet Avenue, the construction of a building with 14 homes is being carried out. This 2 storey penthouse is one of two duplex that have 4 double bedrooms, 3 complete bathrooms (2 en suite), living room of 40m2 with integrated kitchen and separate laundry. Lift directly from the parking space of approx. 11,50m2 and storage room of 13m2. Very quiet area and within walking distance of the main street of Jesus with all kinds of shops, banks, restaurants, etc. Modern, spacious, bright and in a very hike location. Do not miss it!